Energy stocks are the worst-performing equities over the last three months, but there’s one small concession for the sector. At the very least, it hasn’t plummeted as much as the oil market. Oil prices have tumbled about 30 percent after hitting four-year highs at the start of October, with U.S. crude tumbling below $50 a barrel on Thursday after reaching nearly $77 weeks ago. Meanwhile, the S&P 500 energy sector is down roughly 15 percent over the same period. Analysts and portfolio managers say it makes sense that energy stocks fell less than oil prices over the last eight weeks. Since the sector didn’t run up as much as crude futures during September’s oil market rally, energy stocks weren’t poised for such a precipitous fall. But the wild swings in the oil market over the last few months explain in part why the moves in energy stocks are less pronounced: The oil price volatility has encouraged stock investors to play wait and see. 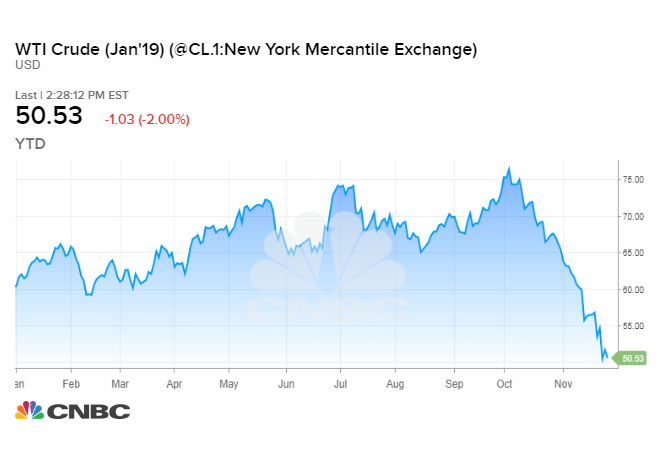 “If you don’t have conviction on the commodity prices, which nobody does right now … it’s harder to make the case that now’s the time to buy energy, versus perhaps another sector,” said Tamar Essner, director of energy and utilities at Nasdaq Corporate Solutions. Energy portfolio managers also say the flood of money into the technology sector throughout much of this year meant investors largely overlooked energy stocks even though they were clearly undervalued. Energy did briefly outperform other sectors from early September through early October, when oil prices spiked ahead of U.S. sanctions on Iran’s energy industry. But the slide in oil prices is once again keeping investors on the sidelines. To be sure, the energy sector seldom rises and falls in lockstep with oil prices. That’s largely because not all stocks in the space are directly linked to the cost of crude. Energy giants like Exxon Mobiland Chevron have refining businesses that benefit from low oil prices, and profits at infrastructure companies mostly depend on the volumes flowing through their pipelines. But even independent drillers focused on producing and selling oil typically have insurance against falling prices, said Essner. Many drillers take out hedges, a strategy that essentially locks in a price for oil shipments well ahead of delivery to customers. Stock investors are also primarily focused on a company’s future earnings and growth, Essner noted. Since the worst of the oil price declines are concentrated in contracts for delivery in the next few months, investors aren’t necessarily panicking about a prolonged oil price slump. The oil price-energy stock mismatch can also be explained by one-off anomalies, according to Jay Hatfield, CEO and portfolio manager at Infrastructure Capital Management. Oil prices plunged nearly 8 percent to $50 a barrel on Friday, which happened to be the lowest volume day of the year in U.S. stock markets due to the Thanksgiving holiday. Since there weren’t many stock traders at their desks, the oil price plunge didn’t have an outsize impact on energy equities. “The commodity market can get out of whack in low-volume times, and stocks aren’t necessarily going to follow, because it’s completely irrational,” Hatfield said. That jibes with the growing consensus that supply and demand fundamentals only account for the first leg of the oil price downturn. A growing chorus says much of the pullback is due to trading strategies that exacerbate selling, rotation out of sagging crude futures and into surging natural gas contracts, and the steady unwinding of bullish oil bets placed earlier this year. The brisk pace of mergers and acquisitions shows that strategic buyers recognize the value in the sector, according to Hatfield. That could be a signal for investors to buy into the energy sector, he said, particularly as oil looks like it’s bottoming out and traders have been chastened by the recent pullback in tech stocks. “It’s helping that people realize it’s not risk-free to buy Amazon at $2,000 per share,” Hatfield said. Rob Thummel, portfolio manager at Tortoise Capital, believes energy stocks are thoroughly undervalued. He expects oil and gas drillers to generate “mountains of cash flow” that will underwrite growing dividends and stock buybacks over the next few years. However, he doesn’t expect generalist investors to immediately pile into the sector. Until recently, many drillers reinvested virtually every dime earned into hiking oil production. Thummel said investors haven’t yet seen the fruits of the industry’s recent commitment to financial discipline and value creation. “We’re probably in the first or second inning of this. This new era, this new mantra for management teams of cash flow growth and returning cash to shareholders started in 2017,” he said. The more immediate catalysts for oil prices and energy stocks will be the G-20 summit in Argentina this weekend and OPEC’s meeting next week. The market is watching the G-20 gathering for signs of easing U.S.-China trade tensions, which have stoked fears of slowing global growth and weakening oil demand. At the OPEC meeting, the cartel and its oil market allies will decide whether to launch a fresh round of price-boosting output cuts. Eric Nuttall, senior portfolio manager at Ninepoint Partners, thinks OPEC will throttle back production, largely because many producer nations need higher prices to balance their budgets. In his view, that would tee up a rally back toward $70 a barrel for U.S. crude and prompt investors to reconsider the undervalued energy sector. “Everybody is feeling significant fatigue. Four of the past five years have been horrible for energy investors, outside of 2016. People need to be given a reason to buy back into the sector,” said Nuttall. ← Falling Oil Prices May Make Trump Happy but They Pose Risks for U.S.